The makers of Ek Ladki Ko Dekha Toh Aisa Laga released an upside-down poster earlier this morning which will flip your perspective of Love. 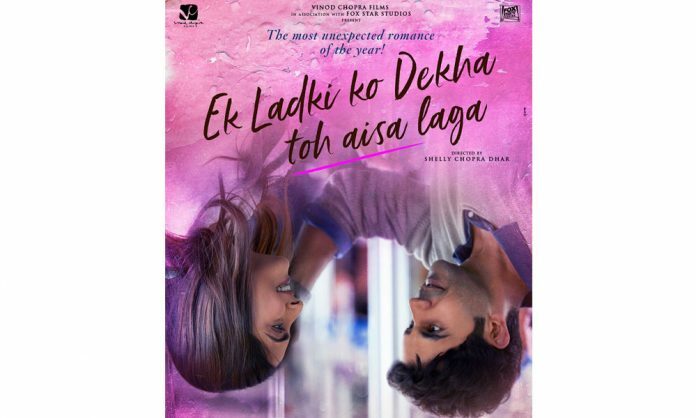 The poster of Ek Ladki Ko Dekha Toh Aisa Laga sees Rajkummar Rao and Sonam Kapoor Ahuja sitting and smiling but what is interesting about the poster is that it is upside down denoting that this love story is quite different from what we are expecting. The first look poster was revealed on Anil’s Kapoor’s birthday and was shared by daughter Sonam and Rajkummar. Also, the makers of Ek Ladki Ko Dekha Toh Aisa are all set to treat the audience with the title track today. ‘Ek Ladki Ko Dekha Toh Aisa Laga’ has an ensemble cast of Anil Kapoor, Sonam Kapoor, Rajkummar Rao & Juhi Chawla.